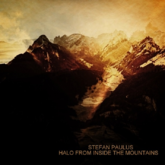 Buddhist on Fire welcomes the return of Stefan Paulus with his release "Halo From Inside The Mountains": crafted using field recordings made over the course of a year in the mountains of Appenzell in Switzerland it thus encompasses all seasons. This work incorporates field recordings of the territory of Appenzell and of the traditional and pre-modern rituals of the locals. Appenzell is a small mountain county in the eastern part of the Swiss Alps. The mountain ridge of the Alpstein is crossing the high plateau of Appenzell with the highest mountain called “Säntis” – the holy mountain, 8208ft above sea level. The Alpstein area has many unexplored caves. I wander there with mountaineers and cave explorers. The pre-modern rituals take place by the end of the year when groups of men running with bells and chimes through the small mountain villages, singing and chanting and doing an old form of the yodel – the “Naturjodel”. In the early morning they come from remote hamlets, walk from house to house to wish the people a happy new year and to exorcize the evil spirits from the old year. Their faces are hidden behind masks and they wear horrific costumes made of materials from animals of the backwoods. 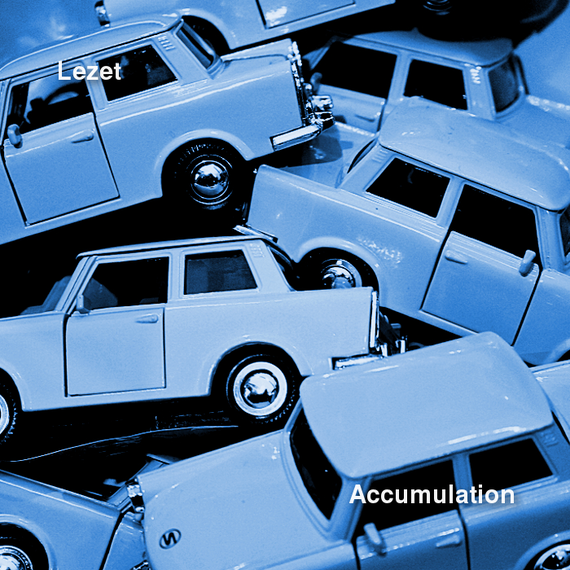 For hundreds of years these rituals have taken place on that Swiss plateau. Nobody knows exactly where these rituals comes from. Sometimes, when one is moving silently through such an utterly desolate landscape, an overwhelming hallucination can make one feel that oneself, as an individual human being, is slowly being unraveled. The surrounding space is so vast that it becomes increasingly difficult to keep a balanced grip on one's own being. The mind swells out to fill the entire landscape, becoming so diffuse in the process that one loses the ability to keep it fastened to the physical self. Summer. Sun. Dark clouds gather. 3 clock in the afternoon. 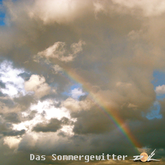 Crackles and thunders, there is something in the air. 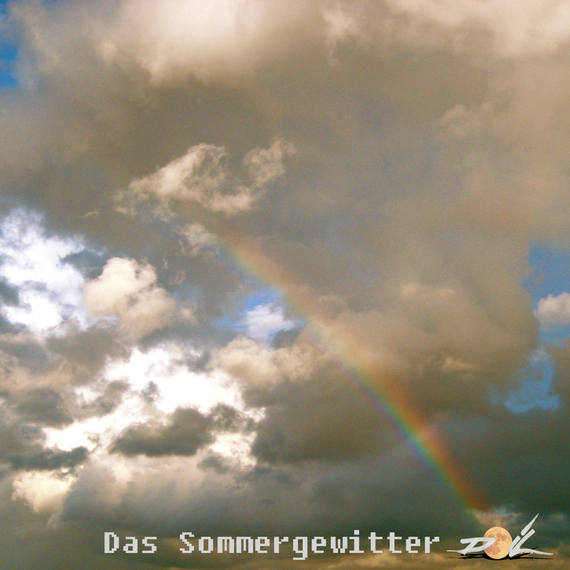 A summer storm. 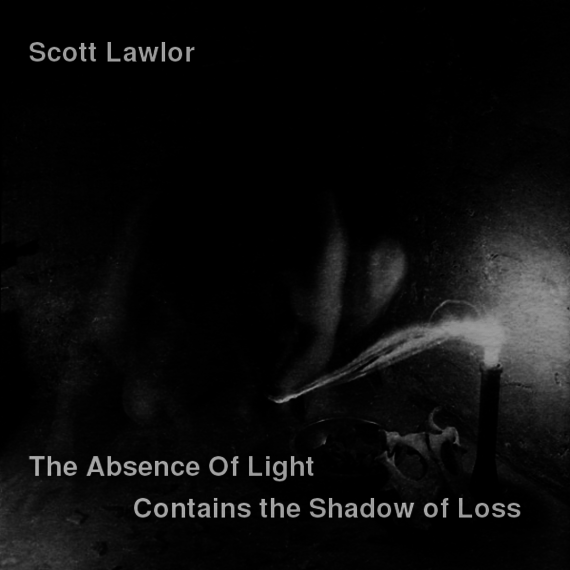 The 37-minute one-shot track joins six ambient soundscapes pieces together, surrounded by field recordings of a summer thunderstorm in Mainz. Sound sources and feedback includes a baby monitor, chandeliers, a microwave and an oven alarm clock. - William Ernest Henley, Rhymes and Rhythms. Performed live on stillstream.fm Mother's Day evening May 10, 2015 using midi controller, Linux, Hackintosh, field recordings and various samples. 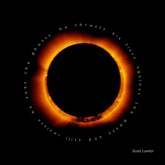 Music fashioned using the buddhalizer --a virtual extension of my imagination. 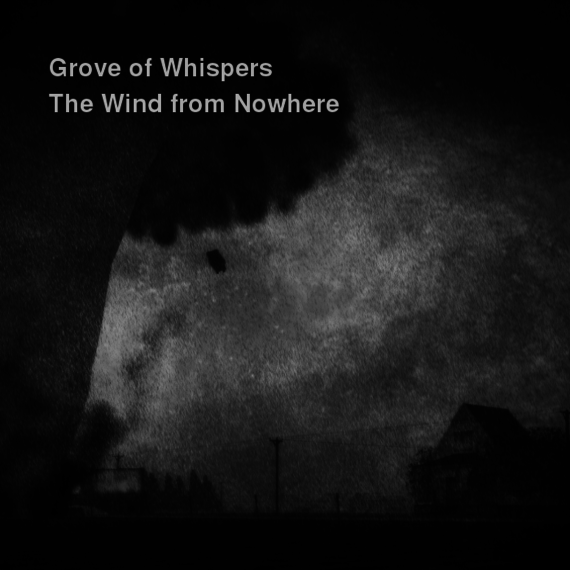 All Grove of Whispers performances are improvised. Nothing is ever planned or orchestrated. Somehow, sometimes it works out. Somehow usually it works out. Dedicated to my mother Margaret Pelaitai. Thank you for always being there. I love you mom. I feel that the surrealists have created a series of valid external landscapes which have their direct correspondences within our own minds. 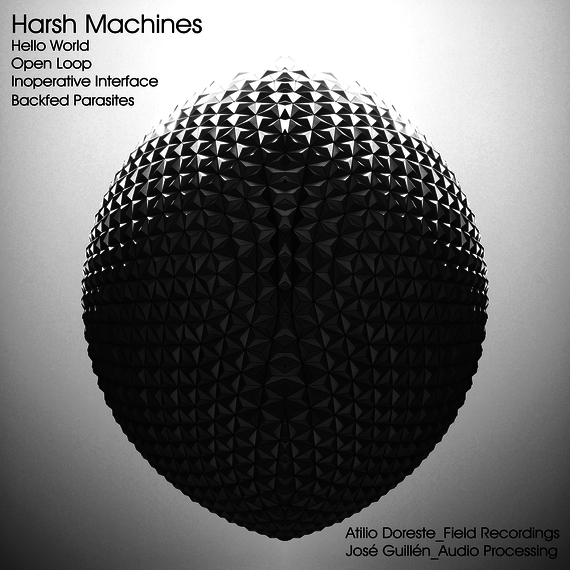 HARSH MACHINES es el resultado de un proceso creativo entre los autores que empieza en el trabajo de campo que realiza Atilio Doreste, y el posterior feedback electrónico de José Guillén, por medio de procesos digitales del audio original. El punto de partida es siempre lo que podemos llamar un suceso fonográfico enfocado hace la parte menos amable del un mecanismo cotidiano. El lado áspero de la máquina se interpreta desde su potencial expresivo, para llevarlo a un extremo de excitación sonora compleja, y de múltiples capas. Son artefactos resonantes que enfrentan al lado oscuro de cada mecanismo, para transmutarlo en un estado anímico diferente o, al menos, extrañado. Es así que HELLO WORLD interpreta el sistema electrónico de los ascensores de un centro comercial; OPEN LOOP explota hasta lo excéntrico, el tránsito vibratorio de las vías de tren en el extrarradio de una gran ciudad; INOPERATIVE INTERFACES explora la complejidad sonora de un cuarto de una universidad en el que funcionan cientos de ordenadores en la realización de cálculos de investigaciones científicas online, BACKFED PARASITES acomete el desarrollo de las señales hacia un Smartphone que transmite un pequeño amplificador que es invadido por interferencias en retroalimentación. Mayo de 2015 en las Islas Canarias. Quote=I believe that the justification of art is the internal combustion it ignites in the hearts of men and not its shallow, externalized, public manifestations. The purpose of art is not the release of a momentary ejection of adrenalin but is, rather, the gradual, lifelong construction of a state of wonder and serenity. 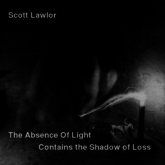 Scott Lawlor, ambient musician and host of The Blind Flight podcast, brings his track "He thrusts his fists against the posts and still insists he sees the ghosts" to buddhist on fire. A long form organ drone. From time to time I heard the sound of words, and marked a difference. Because until then, I realized, the words I had heard had been silent. There had been no sound, I had sensed them. But silently, the way you hear words in your dreams. CDRX a citizen of Elgaland-Vargaland began making music in 1996. 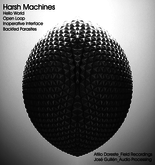 He started as Cereal Killer and does audio manipulation and mixes using sound bites, field recordings, loops, distortions and harsh noise. 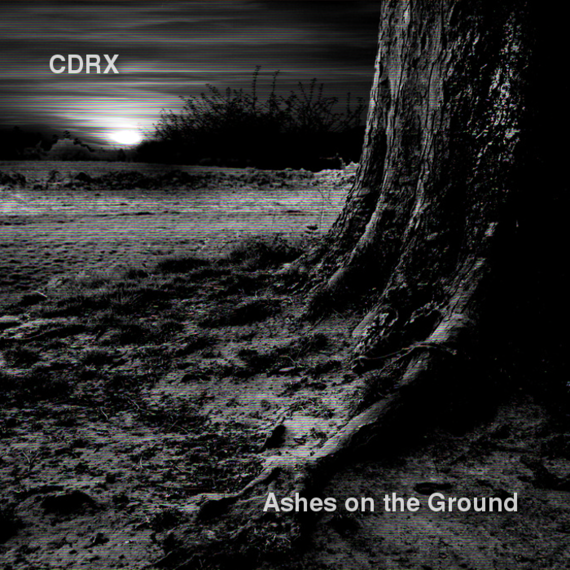 CDRX has created and released a number of cds via his own label Bad For Health Records. "I listen to a lot of industrial, ambient and concrete music but also metal, folk and pop." 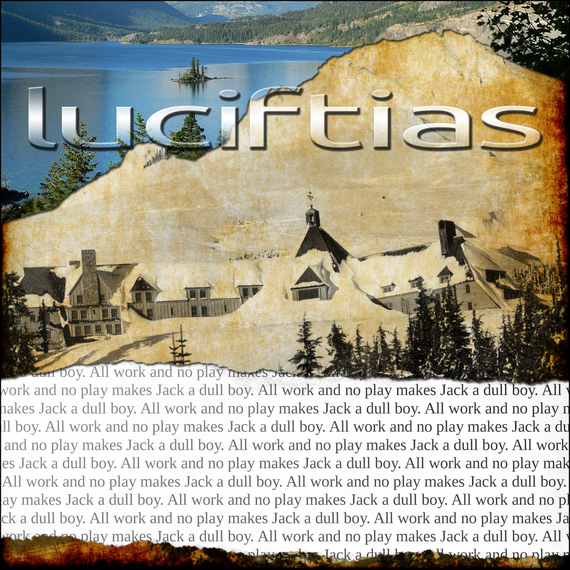 He takes his inspiration from the likes of Nurse With Wound, Pierre Henry, Final and Aidan Baker and many more. Because today we live in a society in which spurious realities are manufactured by the media, by governments, by big corporations, by religious groups, political groups...So I ask, in my writing, What is real? Because unceasingly we are bombarded with pseudo-realities manufactured by very sophisticated people using very sophisticated electronic mechanisms. I do not distrust their motives; I distrust their power. They have a lot of it. And it is an astonishing power: that of creating whole universes, universes of the mind. I ought to know. I do the same thing. I particularly admire Anastasia Vronski's release "The Kursk". 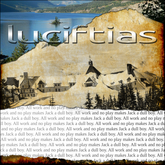 It has a dark, murky crunchy sound that is very inspiring for me. 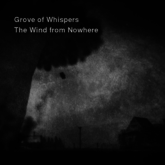 I asked her if she wouldn't mind contributing a similar track and for a split release with Grove of Whispers. 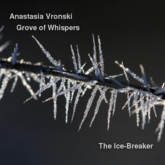 She sent me her track "The Ice-Breaker" and some months later when reviewing a Grove of Whispers performance I realized "oh, this is the companion piece for Anastasia's The Ice-Breaker!" I hope you enjoy it as I do. 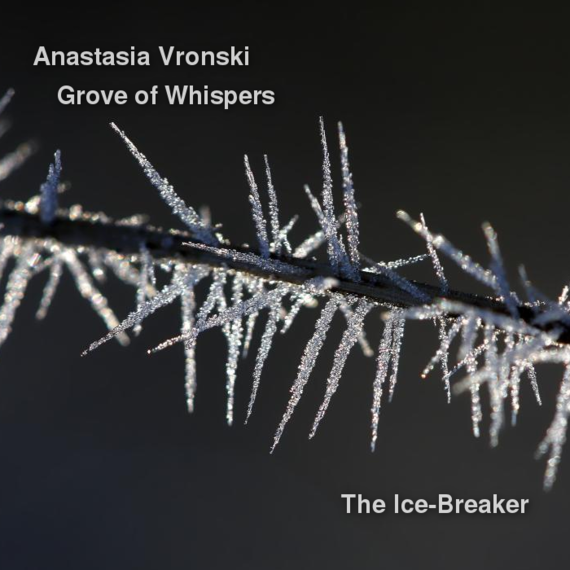 Thank you Anastasia Vronski for your inspiration. ...the distinction between past, present, and future is only a stubbornly persistent illusion. 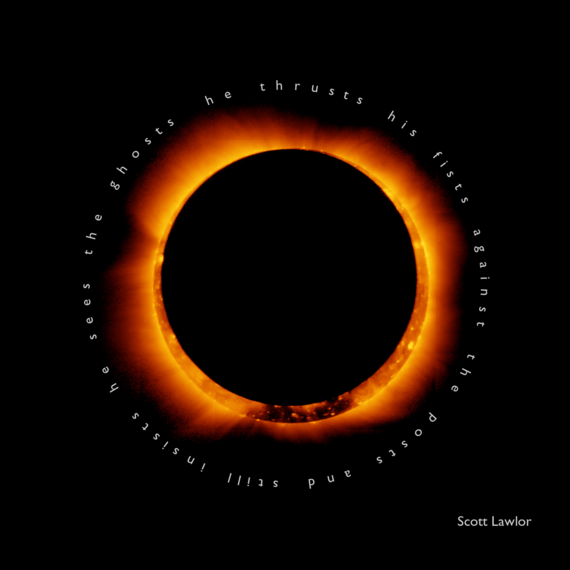 The tracks on this EP are in themselves a form of musical accumulation- they are linear and gather different sound elements of disparate sonic quality as they progress, somehow lending themselves to a unified body of music. When you start the next project you have to forget everything you did before, otherwise Dark Knight will start to sound like Kung Fu Panda. The thick fog enveloped his figure, a lonely form on a bridge overlooking the river below his feet. The afterlife, it had to be better than this. When had his descent into darkness begun? Had it always been there? Whispering to him hauntingly, beckoning him to embrace it. Desolate in the dark, surrounded by nothing but regret. Wrong turns, the steps that seemed to go nowhere, climbing aimlessly. Out of focus, feeling that there was something more but wondering, yes wondering how to obtain it, and if he could, maybe there would be hope. Now just the bridge, in the city shrouded in fog. A faint scent of perfume and then soft footfalls. A delicate hand on his shoulder, and a whisper: "a dream of beauty is an illusion in a life of loss". People have a lot more of the unknown than the known in their minds. The unknown is great; it's like the darkness. Nobody made that. It just happens.